One of the things that I hear teachers worrying about is the disappearance of creativity in the curriculum. More and more districts are ramping up the standardized exams to prepare students for the bigger standardized exams they will take later in the year. The beauty of creativity is slowly being phased out and replaced by worksheets. Standardized tests are a reality where I teach, but I still find creativity time for my students. I feel that it helps strengthen their other skills and is needed to develop well-rounded people. Here are some things that can add a creative spark into your class and still prepare them for those exams. This is one of my favorite things to do with my students -- and the students always impress me with their work. A standard project has students just completing a task set out by the teacher. While students might be able to get creative within those guidelines, it can be tough for them to really explore when the grade is on the line. With an open-ended project, the students get to choose the type of project they want to create and the rubric by which they'll be graded. Students are excited to explore different passions and present their discoveries in ways that are comfortable to them. As the teacher, I provide some small guidelines for them to follow. I give them the topic (for example, themes and symbols from The Great Gatsby), and I ask them to create a presentation that addresses it. I work with them on creating a rubric and share with them the good and the bad of trying to make rubrics that assess student work. I also tell students that they cannot do the same project type over and over again. If they made a movie for the year's first project, they have to choose something else. I want them to stretch their thinking and try new ideas. With open-ended projects, I see a higher engagement rate in my class and a stronger understanding of the material, because they're given the chance to explore and present in a way that's meaningful to them. By working in a medium where they're the most comfortable, they can explore the information more fully. When students are tasked with understanding literary terms, concepts, etc, giving them the chance to understand these things in a different way will help prepare them for later in the year. This has been a big change in my classroom, and it has really given my students a chance to explore their creativity. Depending on what level you teach, you can devote one hour a day or one day a week over a set time period for letting students explore something they're passionate about. This allows them to attempt things they might not try outside of school because of time constraints. 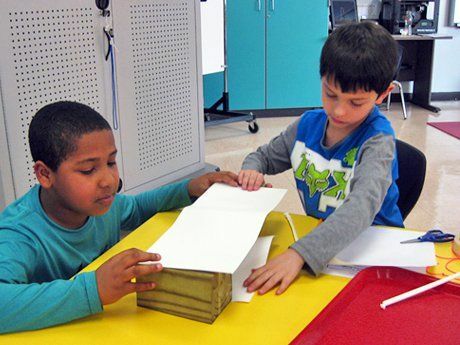 By encouraging students to work on something they care about in school, they begin making connections between their passions and their learning. I had a student build a boat with his grandfather this year. He spent his class time researching the different aspects of boat building and blogging his reflections on the entire process. He was so excited to build the boat and spend time with his grandfather that he didn't truly realize how all of his writing and research was actually learning. He was able to improve those key skills by working on something creative that mattered to him. Sometimes, it's fun to just get the kids together and do some team building. We're so test- and grade-driven that we forget how class isn't actually a competition that pits student against student. A classroom should be a collaborative environment where students work together to support everyone's learning. A great way to set the tone is by starting the year with some fun team-building exercises. My favorite is a simple team task that can take one class period. I set out big and small marshmallows and some raw pasta, divided the students into groups of five, and asked them to build the tallest freestanding tower. You can tweak the task by giving different groups slightly different amounts of marshmallows or pasta, set a time limit, or do anything you want to personalize the task. Once the students have the supplies and an understanding of what you expect, sit back and watch the creativity explode. Students love to problem solve. They just don't want to do it in a math textbook most of the time. They'll always come up with creative ways to solve problems if you give them time. In trying to build a tower, I've seen students pull knowledge from algebra and physics in explaining why certain plans would or would not work. Solid communication skills and planning are needed to be successful. In fact, all of the skills that students have picked up in the classroom can be seen when you give them a problem and time to solve it. Creativity should not be relegated to English class or the art room. There are places for all teachers to add creative elements to their school days. It's important that we light the creative fire under our students -- otherwise, we'll watch a nation entering a dark age with very little creativity. Creative thoughts are what took us to the Moon. We need to make sure that we remind students of the value of creativity, and that we give them every chance to show it in the classroom. How do you promote creativity in your classroom? Share it with us in the comments section below.